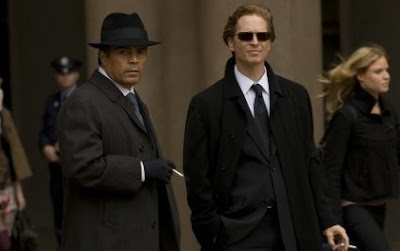 Caprica, stars Esai Morales (left) and Eric Stoltz (right), it is a prequel set 50 years before the events of Battlestar Galactica. Caprica is a "backdoor pilot", shot with the hope that an ongoing series will continue after the TV-Movie. SCI FI has now rumouredly ordered two more Caprica scripts, for potential episodes of an ongoing series. Ron Moore continues to be involved with Caprica, along with two Battlstar writers, Michael Angeli and Mark Verheiden. They are joined by Ryan Mottesheard, a former writers' assistant on BSG. The Caprica TV-Movie is expected to air this fall. Well Caprica is filmed and news continues to pour about the upcoming Battlestar Galactica TV-Movie, which begins filming next month. Galactica staff writer Jane Espenson will write it. David Weddle revealed that he and Bradley Thompson were originally going to write the TV-Movie, but the duo have accepted a new job on CSI which would have conflicted. As for the storyline, while the details are being kept a secret, Aaron Tyrol Douglas told his fansite that the movie will take place during Season 1 of the series and feature much of the known cast. SCI FI was said to be considering up to three Galactica TV-Movies. Now however, the one shooting in August is likely to be the only one. What's still unclear is when it will air - though it's assumed it will be sometime before the final episodes of Galactica debut in January 2009. I saw this trailer this morning and the first thing that jumped out at me is like, wait Adama dad was responsible for creating the first cylon (as in to replace Bill's sister no less) and we still don't know who the last cylon is... maybe young Bill Adama had an accident himself and his old man decided to replace him. I'm sure the forums some where are going mental. I was pleasantly surprised at how good the trailer looks, but must say it dampens the "shock-factor" for what is to come with Cylon "skin-jobs" . . .